Going grain free doesn’t mean you have to give up on your favorite comfort foods. 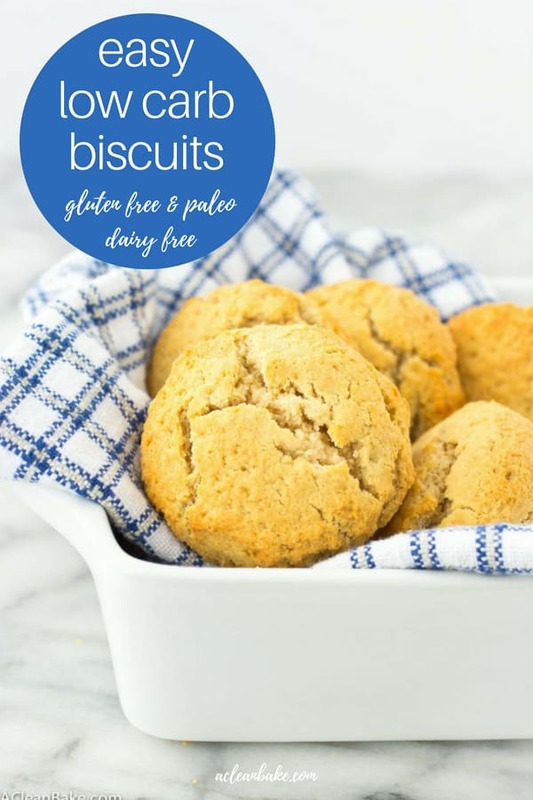 These paleo and gluten free biscuits make a great morning nosh, or accompany a delicious dinner. They’re easily adapted to be dairy free, too. The day your grain-free biscuits finally rise is a very good day. That’s not a euphemism or a metaphor; it just took a lot of tries before I finally got the tall, crackly and fluffy result I was looking for. But it was well worth the effort. Because, really, what meal isn’t improved by a soft, warm biscuit on the side? Think about it: everything from breakfast to barbecue to soup goes becomes a meal if you add a biscuit (or three). I’m happy to report that these are insanely easy to make with just a handful of ingredients, including my favorite combination of flours for grain-free breads: almond flour, coconut flour and tapioca flour. Just add salt, leavener, eggs and grass fed butter or (non-hydrogenated) shortening. A quick note about the fat in these recipes: I tested these with real butter, shortening, and coconut oil. The oil version doesn’t rise as much, so just be warned if you want to make that substitution. The butter option – regular or vegan – is the better way to go, and you must (must!) chill it for at least a couple of hours, because cold fat contributes to leavening. If you really want to be authentic, you can even cut in the butter until it is the size of small peas instead of melted it and stirring it in – but that’s my favorite shortcut for quicker biscuit-making. I first made these for a dinner party hosted by some friends who aren’t accustomed to eating gluten/grain free. Luckily, they are incredibly open minded and just like good food, so they aren’t the type to shy away from something with a grain-free label just because it’s unfamiliar. I think they loved these, or at least did a great job of being polite by eating several biscuits each. Even my gluten-loving husband who regularly asks me to make or buy “not weird” baked goods turned down a regular gluten roll in favor of one of these at dinner the other night. Now that’s what I call a success. In a large bowl, whisk together the dry ingredients (almond flour, coconut flour, tapioca flour, salt and baking soda). Stir the butter into the dry ingredients until well-mixed. Set aside. In a separate bowl, quickly whisk together the eggs, coconut milk, and vinegar. Then stir into the dry mixture, just until the liquid is absorbed. Gather the dough into ball. Transfer to a piece of wax paper, or a silicone mat. Roll the dough into a 2 - 2 1/2" thick disc. Use a biscuit cutter to cut out 10 biscuits. Refrigerate for 2 hours (or overnight) in an airtight container. Preheat the oven to 450 and line a baking sheet with a nonstick pad. 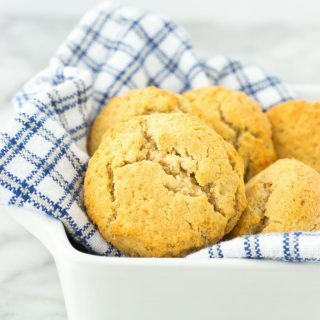 Once the oven is preheated, remove biscuits from the fridge, arrange 2" apart on the prepared sheet, brush with melted butter, and bake for 10-12 minutes, or until puffy and slightly golden. 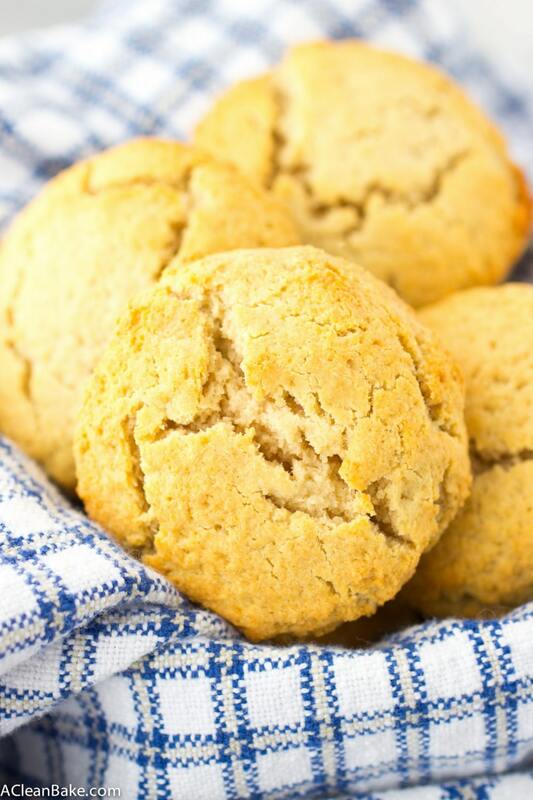 You can use coconut oil in place of the butter, but your biscuits won't rise as much. Or use cold shortening. Nora, you are totally my hero 🙂 Thanks for doing all the heavy lifting so I can just use this recipe to my heart’s desire–they look incredible! 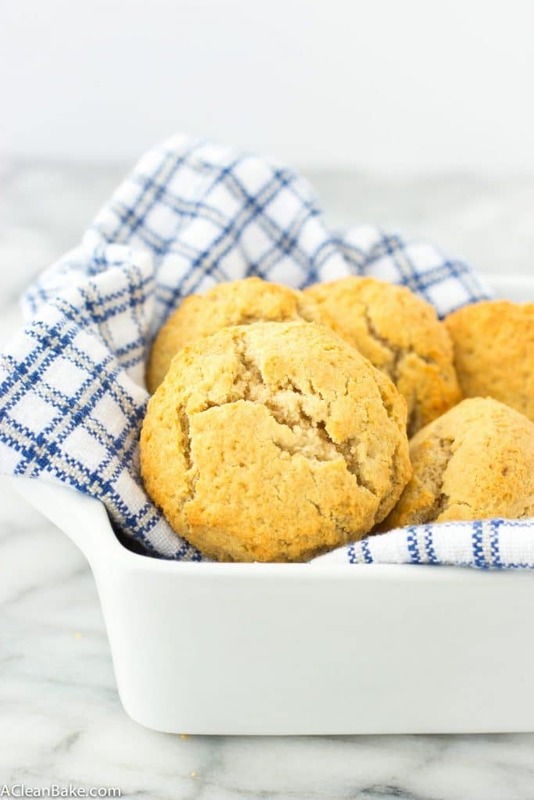 I’ve been looking for a gluten free biscuit, and I love that you also mentioned what coconut oil will do in this recipe (since I don’t like using vegan butter). I’m super excited to finally have a recipe to try that look pretty simple and I have all the ingredients!! I would love to make these as a potpie topping or serve with mushroom soup. OMG yum! These would be awesome as a pot pie topping – what a great idea! 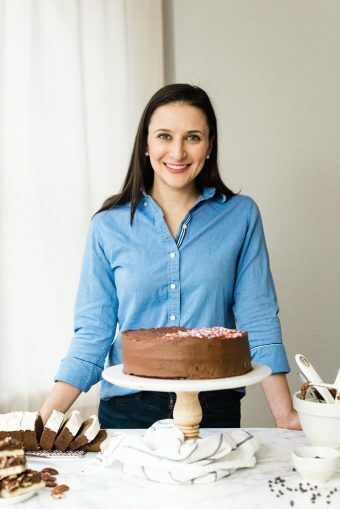 I absolutely love introducing my non gluten-free friends to my gluten-free bakes…they’re always amazed, which gives me positive reinforcement that the GF thing isn’t just a hippy trend, it’s for real, yo! And so’re these biscuits! I want them in my face for real! You’re totally right! It’s one thing if someone who is used to gluten/grain-free likes a dish, but the really amazing moment is when someone who doesn’t eat gluten free doesn’t even notice! “Because, really, what meal isn’t improved by a soft, warm biscuit on the side?” <TRUTH. Biscuits make everything better! I never would've guessed these were gf, your flour combo is almost magic Nora! Gorgeous photos as always and seriously I have been craving comforting biscuits/cornbread/creamy polenta so this recipe needs to happen. I don’t have tapioca flour on hand…is there anything to substitute it with? Oh yes! You should be able to use cornstarch instead! Full disclosure: I haven’t tried it – but the starch content is about the same so it shouldn’t make a huge difference. Let me know how it goes!! I think I could make a meal out of these biscuits and these biscuits alone! They look fantastic! Pinned! These look so wonderfully sunny! Biscuits are like the BEST comfort food. And with this miserably cold winter, I’m all about comfort 🙂 Yum! They sure are! They would probably be even fluffier if I had cut the butter in properly, but I needed biscuits and I needed them now! Could this be made without almond flour? What do you think I should substitute – more coconut flour? I can’t have nut flours, though I can do coconut flour – but I would really like to try this. Thanks! Hi Jody, unfortunately, no I wouldn’t recommend replacing the almond flour. I’m sorry!